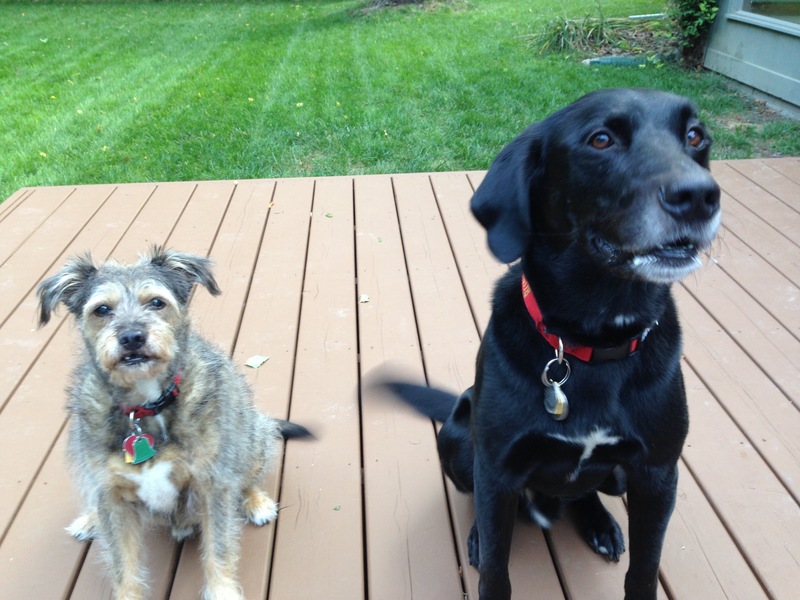 Skippy (left) is a fifteen-year-old Terrier mix who poops in the dining room. His room mate Buddy is a three-year-old Black Lab mix who also has accidents in the home. After observing the dogs while discussing the situation with their guardians, I noticed a number of dominant behaviors from Skippy. They were pretty subtle, but I took notice of them as they offered me some insight into the dog’s mindset. Buddy on the other hand was your stereotypical black lab; higher energy but very friendly. I started out by suggesting some rules and boundaries for their guardian to adopt. As is the case with many of my client’s, the dogs didn’t really have much structure. This lack of discipline had resulted in different problems for each dog. Skippy had come to think of his guardian as his peer or mate. As a result he only listened when he felt like it, showed little respect for his guardian’s personal space and nudged or pawed at them when he wanted attention. For Buddy, the lack of structure had resulted in a dog that had little practice controlling himself. At times his excitement level got so high he almost knocked over his guardian. I showed their guardian some new ways to communicate with the dogs. By using body language, movement, eye contact and an assertive energy, the dogs will instantly understand what their guardian does and does not want. I also suggested some rules and limits to help the dog’s start to see the distinction between themselves and the humans in the house. It was clear that the dogs loved and trusted their guardians, they just didn’t respect them as authority figures. Each time the guardians correct the dogs with good timing when they break the new rules and boundaries, their status as authority figures will be built up and reinforced to the dogs. To address the accidents in the house, I inquired as to how the dogs were potty trained. Their guardian had incorporated a few of the right elements, but had left out a few steps that tied everything together. I went over a new way of conditioning and rewarding he dogs for eliminating outside. By marking the act with a command word during elimination and consistently providing a positive reinforcer after, both dogs will understand that eliminating outside is not only desired, it makes the guardians happy. It will probably take a week or two of this new procedure until the dog’s get the picture. Until the dogs are conditioned to only eliminating outside, I suggested that the guardian introduce a kennel for Skippy so that we can eliminate his ability to go inside. Because he hadn’t been kenneled before, I had his guardian set up the kennel but not use it until I arrived. I wanted to make sure that Skippy had a positive association with it. Buddy had been crate trained, but as is the case in many parts of his life, he got over excited when it was time to get released from it. I wanted to see this in action myself so I had the guardian place him into the kennel then we stepped outside for a few moments. It didn’t take long for the deep bass of Buddy’s bark to be heard while we were outside. After a few minutes, we went back inside and down to the basement where Buddy’s kennel was. I had the guardian take my camera and film how I got Buddy to calm down in the kennel before letting him out. As you can see in the video, Buddy was so excited at the thought of being released he was banging away inside the kennel. This was a result of simply letting the dog out of the kennel as soon as the guardian got home. Because he exploded out of the kennel with that much energy, he jumped up on his guardian while trying to run everywhere at once. Just because this wasn’t aggressive doesn’t mean its not dangerous or healthy for the dog. In a very real way, Buddy’s behavior in the kennel as I approached it is a microcosm of his primary issue, being too excited to control himself. By making the dog wait for permission to exit the kennel and only giving such permission when the dog is calm, we can help him develop the ability to control himself. We placed Buddy back in the kennel and went upstairs for a moment before his guardian took her turn at letting Buddy out. By the time we finished the session, both dogs were interacting with their guardian in a more respectful way. Skippy was keeping a little distance rather than jumping up or leaning on his guardian and Buddy was listening and following his guardians commands the first time. By adding rules and structure to the dog’s lives, we can help them learn how their guardians want them to behave. The more developed their ability to control themselves gets, the less the unwanted behaviors will happen.